Is this your first time making Thanksgiving dinner? 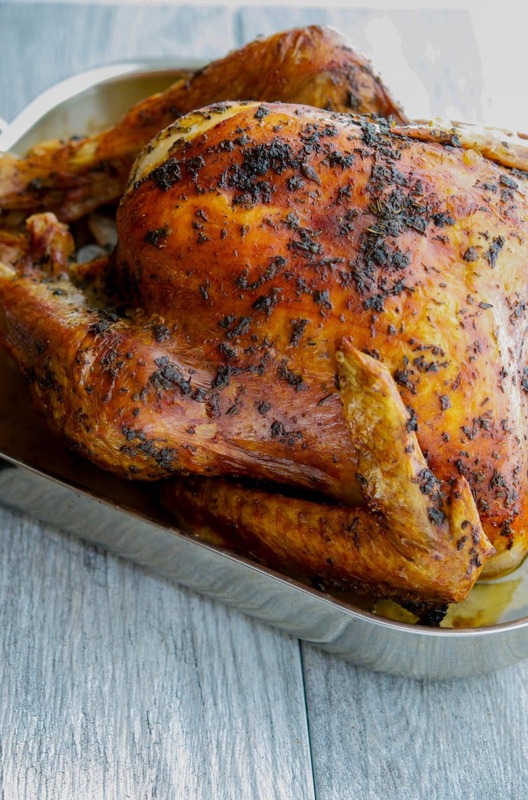 Well, rest assured, roasting a turkey like this Butter & Herb Roasted Turkey is a snap! 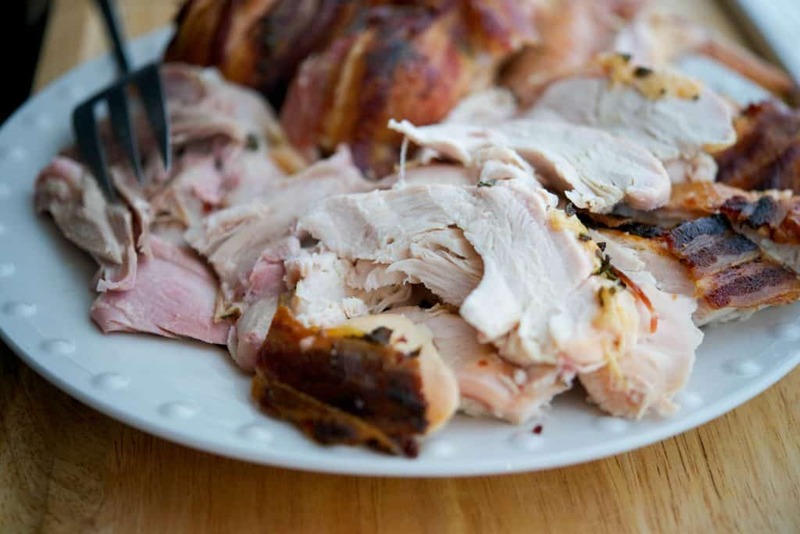 Follow these simple tips on How to Roast a Thanksgiving Turkey. I remember my first time preparing my first grown-up Thanksgiving dinner over 20 years ago. I was so nervous. Yes, I knew how to cook and carve a chicken, but I had never attempted a turkey before. It seemed like it would be much harder. Turns out, it was easier than I thought. Here are a few tips on How to Roast a Thanksgiving Turkey to get you started and host a stress-free Thanksgiving. Generally speaking, figure on 1 lb. of turkey per person. This will allow enough turkey for the meal plus give you extra for leftovers. I don’t know about you, but after cooking all day I rarely eat when it comes time to sit down. I love having leftovers to pick on after my guests go home. 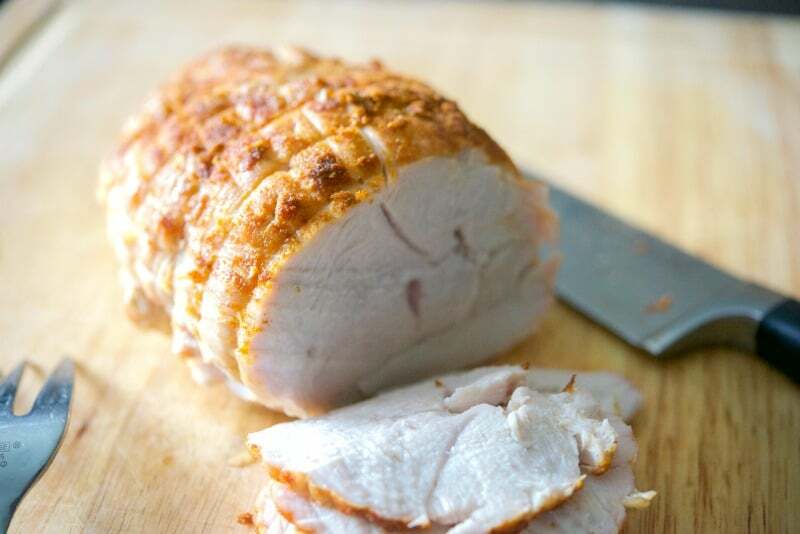 There are many ways to prepare a turkey including brining, deep frying, smoking, grilling and my favorite, roasting. 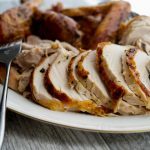 Since I only have experience in brining and roasting a turkey, I’ll be sharing this recipe for Butter & Herb Roasted Turkey with you today as I feel roasting is the easiest way to prepare a turkey for a beginning home cook. 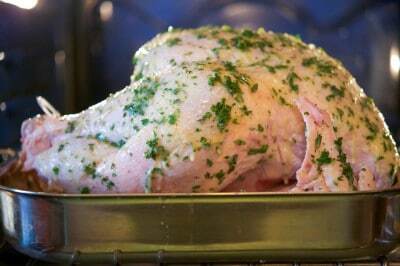 Place your turkey on the rack of a roasting pan breast side up. If not already done, tie the legs together with kitchen string. If you don't have a rack, lay some vegetables like carrots or celery underneath the turkey so that the turkey is elevated. 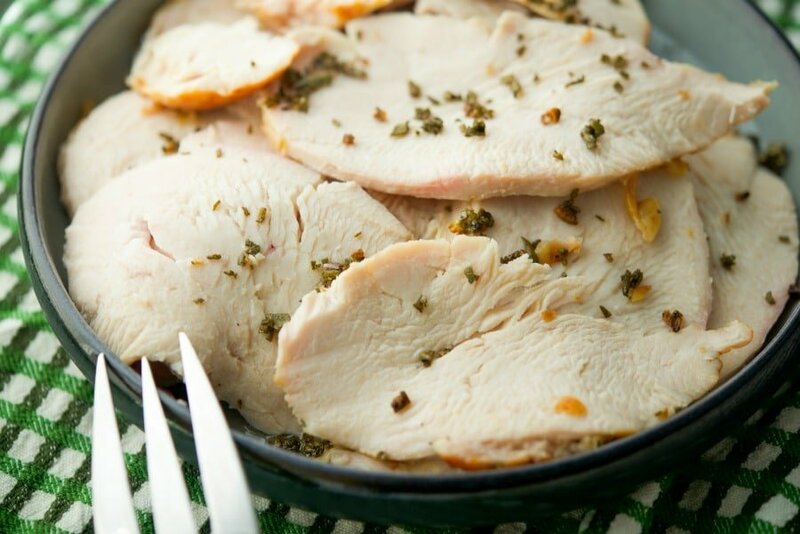 Combine the butter, parsley, rosemary, oregano, salt and pepper in a bowl; then brush it all over the turkey. Pour your liquid into the bottom of your roasting pan and place in the oven. Cook your turkey according to the roasting chart below or approximately 20 minutes per pound. Basting periodically throughout. Remove turkey from the oven and allow to cool for 15 minutes before carving. Use the chart below to determine accurate cooking times based on the size of your turkey. Baste your turkey periodically throughout cooking time and cover the turkey loosely with aluminum foil if the skin is turning brown. 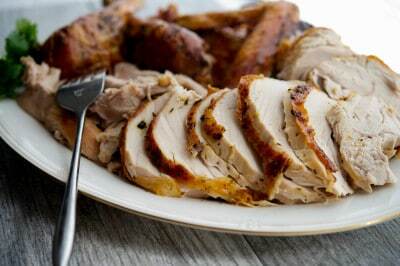 Your turkey is done when the temperature is 180° F in the thigh and 165° F in breast or stuffing. 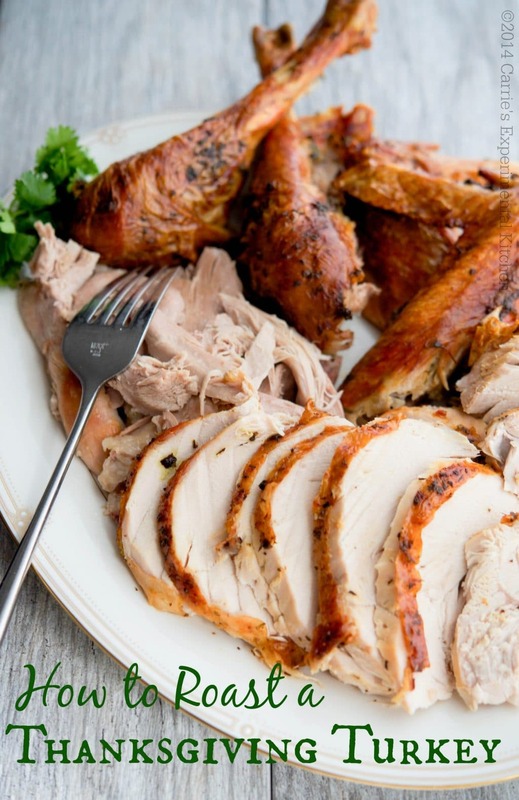 Allow the turkey to rest on a cutting board for 15 minutes after removing your turkey from the oven to allow for the juices to settle before carving. Cut the legs from the body where the thigh meets the breast. Cut through the leg joint to separate the drumstick from the thigh. If you prefer your dark meat sliced, hold the drumstick by the leg and slice the meat downward off of the bone. For the thigh, cut the meat off of the bone angling the knife as you go. Carve both breasts from the breastbone and ribcage; then slice the breast crosswise into 1/2″ slices. You can’t have a beautifully roasted turkey without gravy now, can you! 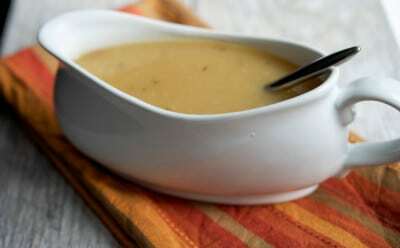 You can thicken your gravy with either corn starch or flour. For both, you mix with cold water to form a thin paste-like liquid before adding it to your pan drippings. Cornstarch makes for a silky smooth gravy; however if you can’t tolerate corn or corn products you have to use other methods. Using flour will also work well; however, it takes a little more elbow grease as you have to make sure you smooth out all of the lumps the flour creates. Place the pan drippings in a saucepan, removing as much excess oil as you can. Heat the pan drippings over medium high heat; then add your thickening agent (cornstarch or flour and cold water). Whisk until the gravy is smooth and has thickened to your liking, season with salt and pepper; then strain the gravy through a fine sieve. The most difficult part about hosting any holiday is just getting all of the food items on the table at the same time. 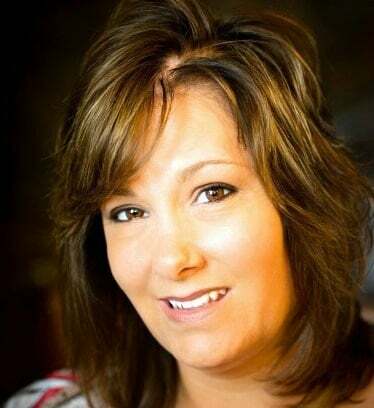 Thankfully I’m an UBER multi-tasker and planner so I did just fine and you can too! Below are some helpful tips that I’ve found invaluable over the years to reduce stress when planning such a big event. Plan your menu at least 2 weeks in advance (if not sooner) and start purchasing non-perishable items so that your pantry is stocked. If you plan on getting a frozen turkey (like I usually do), purchase at least one week before Thanksgiving so the turkey has time to defrost. The night before the big event, set your dining table and gather all of your serving bowls and utensils and place in the kitchen. Place a post-it note in each serving dish with what will be served. (Example: turkey, stuffing, potatoes, vegetable, etc.). This not only helps me when it comes time to fill the dishes to set on the table, it also saves time if you get some extra hands from family and friends wanting to help out. Last, but not least, sit back, relax and enjoy your handy work and your company. Such a great post Carrie!!! Thanks for sharing your tips! Exciting recipe: simple and perfect explained! Thanks! Happy Halloween & A KitchenAid Giveaway! Thank you Linda, I hope so!